Scientific Examination in Italy Is First of Its Kind Allowed by Catholic Church. National Geographic Channel World Premiere Documentary Chronicles the Scientific Study of Martyrs Said to Have Been Buried Alive. The investigation is the first comprehensive battery of scientific tests ever conducted on the remains of a pair of Catholic saints -- in this case, two virtually complete skeletons -- along with a burial cloth and reliquary box. The team of scientists used a variety of advanced methods, including DNA analysis and carbon dating, to investigate the question, Are these the remains of the martyred Roman husband and wife Chrysanthus and Daria? Legend says the two were buried alive in the third century A.D. after becoming Christians and converting thousands of Romans to their fledgling religion. And can science work alongside religion to support the story of these iconic martyrs? Now, in the week leading up to Easter, the National Geographic Channel world premiere documentary EXPLORER: Mystery of the Murdered Saints, premiering Tuesday, April 19, at 10 p.m. ET/PT, follows the investigation of the mystery surrounding the bones and the scientific studies. "All of the evidence we have gathered points toward the relics having belonged to Chrysanthus and Daria," said investigation leader Ezio Fulcheri of the University of Genoa, who received funding from the National Geographic Society for the work. "This has been a very rare opportunity to be able to study bones and other relics that relate directly back to a legend that has been passed on for almost 2,000 years. The completeness of the skeletons is also rare for martyrs of this era, implying that these relics were protected and venerated in their entirety at a very early point in history." Fulcheri led a team of scientists that included anthropologists Alessandra Cinti and Dr. Rosa Boano, both of the University of Turin, Italy, and Dr. Fabrizio Ambrosetti of Santa Maria Nuova Hospital in Reggio Emilia. The box purportedly containing the two saints' remains was opened for the first time in centuries in 2008 and, to the surprise of scientists and church leaders, was found to contain nearly 150 bones, a rare assemblage to be associated with an ancient legend about saints. The bones made up two nearly complete skeletons. Scientific testing began soon after. Among the first tests, conducted at the University of Salento, Italy, was carbon-14 dating to determine the age of the bones. The result was a range of A.D. 80 to A.D. 340, which coincides with historical recording of the martyrdom of Chrysanthus and Daria around A.D. 283. The project came about as a result of a 2008 renovation at the Reggio Emilia cathedral, causing dismantling of the altar that had been undisturbed since its last recorded opening in 1651. According to tradition, Chrysanthus was born the only son of a Roman senator from Alexandria, grew up in Rome and eventually converted to Christianity. 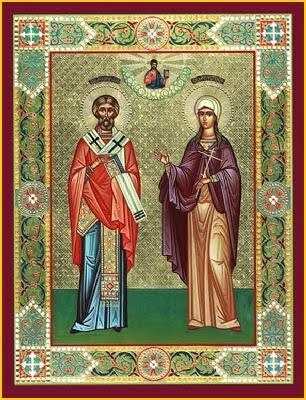 His father disapproved of his conversion and, to bring him back to the Roman faith, arranged a marriage between his son and a high priestess of Rome named Daria. However, the plan backfired, as Daria embraced her new husband's religion and, according to the story, worked with Chrysanthus to convert thousands more to Christianity. Ultimately the two were arrested by the Roman Empire for proselytizing, and around A.D. 283 the young adults were buried alive in a sand mine in Rome. A wall was eventually erected around the grave for protection. Historical sources record that the bones were moved numerous times between 757 and 914, when Pope John X conceded the relics to Italian King Berengario. Finally, in 946 the king donated them back to the church, transferring their custody to the diocese of Reggio Emilia, where, according to the diocese, they have since been kept beneath the church's altar. Upon completion of the study, the relics were preserved and secured in a new reliquary, to be placed once again under the altar at Reggio Emilia. 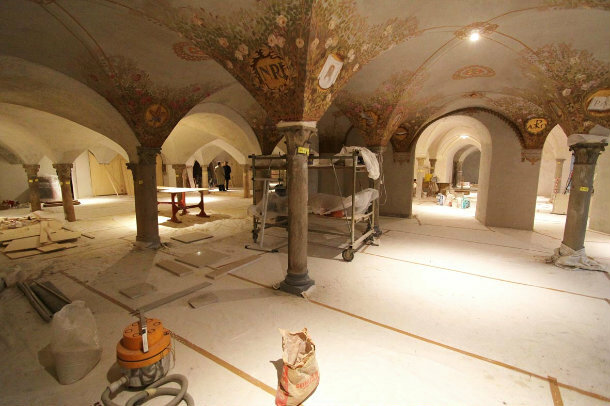 A scientific investigation of human bones locked in a crypt in the northern Italian cathedral of Reggio Emilia since the 10th century supports an ancient tradition that the remains belong to a pair of lovers said to have been martyred almost two millennia ago. The investigation is the first comprehensive battery of scientific tests ever conducted on the remains of a pair of Catholic saints — in this case, two virtually complete skeletons — along with a burial cloth and reliquary box. The team of scientists used a variety of advanced methods including DNA analysis and carbon dating to answer the question: Are these the remains of the martyred Roman husband and wife Chrysanthus and Daria? Legend says the two were buried alive in the third century A.D. after becoming Christians and converting thousands of Romans to their fledgling religion. 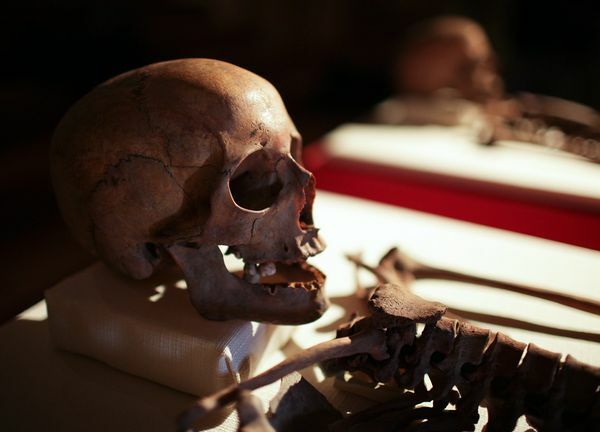 The investigation of the mystery surrounding the bones is the subject of a documentary, “EXPLORER: Mystery of the Murdered Saints,” to premiere at 10 p.m. ET/PT Tuesday, April 19, on the National Geographic Channel. 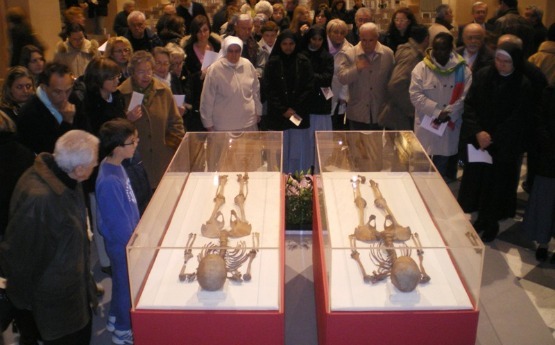 The box purportedly containing the two saints’ remains was opened for the first time in centuries in 2008 and, to the surprise of scientists and church leaders, was found to contain nearly 150 bones, a rare assemblage to be associated with an ancient legend about saints. The bones made up two nearly complete skeletons. Scientific testing began soon after. Among the first tests, conducted at the University of Salento, Italy, was carbon-14 dating to determine the age of the bones. The result was a range of A.D. 80 to A.D. 340, which coincides with historical recording of the martyrdom of Chrysanthus and Daria around the year A.D. 283. * Anthropological studies confirmed the presence of only two individuals among the remains. That study also found that one of the individuals was male and one female, and later DNA analysis, conducted at the University of Florence, Italy, confirmed this. * Anthropological studies and CT scanning established the age of the male to be 17 to 20 years and the female to be 20 to 25 years. These ages conform to the details of the legend of Chrysanthus and Daria. * Pathological studies showed that the individuals had not engaged in significant physical labor; osteological studies showed evidence of lead poisoning. Both of these findings point to privileged lifestyles, thought to correspond to the two saints. Lead tended to accumulate in the bodies of upper-class individuals of that era because, among other causes, lead was present in plumbing systems, systems that were only found in the homes of wealthier families. * Pathological studies showed no evidence of physical trauma or disease. This finding is consistent with what is known about the cause of death of the two individuals. * Studies of pollen residue found with the bone relics found ancient, now-extinct pollen from the Reggio Emilia area. This may trace back to 1522, the time the bones were last exposed to open air. Fulcheri said the bones definitely did not come from the Reggio Emilia area, which eliminates the possibility of a local forgery. Legend says that the couple was killed in Rome and the remains moved several times. According to tradition, Chrysanthus was born the only son of a Roman senator from Alexandria, grew up in Rome and eventually converted to Christianity. His father disapproved of his conversion and, to bring him back to the Roman faith, arranged a marriage between his son and a high priestess of Rome named Daria. However, the plan backfired, as Daria embraced her new husband’s religion and, according to the story, worked with Chrysanthus to convert thousands more to Christianity. Ultimately the two were arrested by the Roman Empire for proselytizing, and around A.D. 283 the young adults were buried alive in a sand mine in Rome. A wall was eventually erected around the grave for protection. Historical sources record that the bones were moved numerous times between 757 and 914, when Pope John X conceded the relics to Italian King Berengario. Finally, in 946 the king donated them back to the church, transferring their custody to the diocese of Reggio Emilia, where, according to the diocese, they have since been kept beneath the church’s altar.